I’ve experienced a few games now from Magic Cube, and while they’ve always sounded interesting on paper, they never quite seem to come together like you would hope. Their latest, Mirror Land ($0.99), is a monster-collecting RPG built around a cute idea. 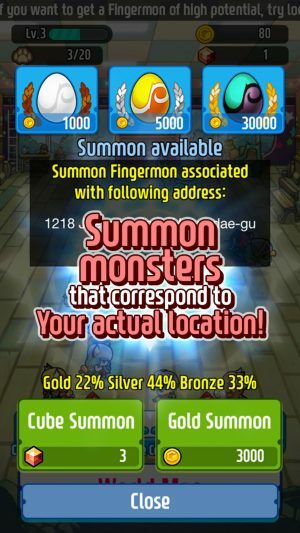 The game uses your actual location and allows you to summon monsters based on that information. The farther you are from where you first started up the game, the more interesting and unusual creatures you’ll find. It’s obviously inspired by Pokemon GO, but it works a little differently in practice. The game attached to that cool idea, on the other hand, is simultaneously the best I’ve played from this developer so far and yet still quite flawed. Mirror Land tries to spin some kind of story around a world parallel to our own where people battle using special creatures called Fingermons that apparently come from our real world. Or something like that. There are evil clones, the hero has amnesia and can’t remember their surely uneventful past, and rivals a-plenty. The plot is rolled out in conversations that occur before and after completing story missions, events that become so spaced out over time that it was hard to remember how things connected. Not that it really matters. This isn’t the sort of thing you’re going to play for its story. No, you’re probably here to collect monsters and do battle, and I can happily tell you that there’s plenty of both things going on in this game. The only way to earn monsters is through summoning, but there are a few ways to go about that. The splashy location-based summoning lets you call a monster using either easily-obtained coins or somewhat harder-to-come-by cubes. You can only summon once in any given location, at least for a certain period of time. It seemed to refresh after around a day. Your initial location when you start the game seems to be set as the home lab in-game, and monsters you summon near that lab will almost always be disappointing and mostly the of the same type. Head a little farther afield and you might find something interesting, though. Most of your monsters will probably come from the standard summoning, however, which doesn’t involve your location at all. 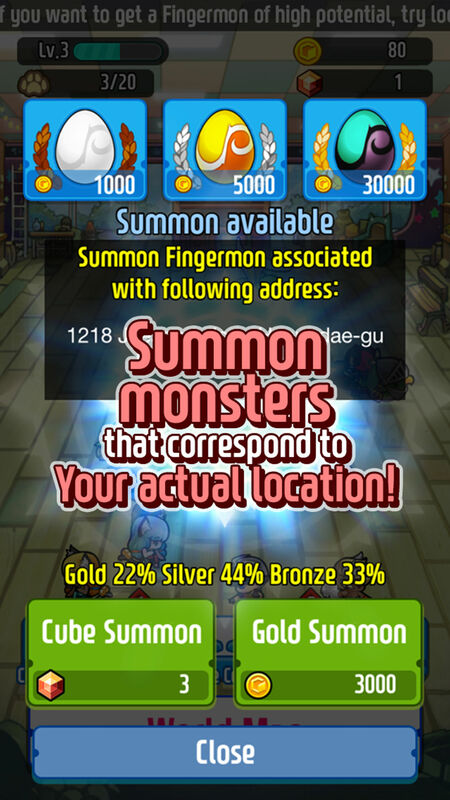 Instead, you choose which of the three types of summon you want to perform, pay the required amount of coins, and collect a random Fingermon whose rarity more or less corresponds with how much you spent. Basically, you can summon a pretty weak bronze character after every couple of battles, hang in there for a bit and get a more useful silver character, or wait until Lucifer dons a knitted sweater and nab a powerful gold character. Mirror Land contains no IAPs whatsoever, so the only way to fill out your collection of monsters is to grind those coins. And grind you will, my friends. There are a lot of things I like about Mirror Land. It’s generally well-crafted, the summoning gimmick is neat, and the battle system is actually pretty fun and somewhat original. Battles play out sort of like the Active Time Battle system in many of the Final Fantasy games. Each character has to wait for a meter to fill up before they can do anything. Once the meter is full, you tap on them to use their action. If you tap just as the meter fills up, you’ll get a bonus. You can also tap just before an enemy strikes to block some of the damage at the cost of a bit of your meter. If you tap before the meter fills, the character will not only fail to act, the meter will also slightly drain. It’s lively, somewhat strategic, and surprisingly tense at times. Unfortunately, it’s also the entire game. You’ll enter battles from a map screen, where you are presented with a random assortment of missions with different conditions. In this one, you can only use bronze monsters. Over here, you’ll have to fight one-on-one. Most of the time, you’ll have a few types to pick from, though they’ll occasionally collapse into a single mission that you’ll have to either pass or fail to get a new spread. The battles earn experience for participating Fingermons, experience for your hero, and either coins or cubes. Fingermons can only level as high as the hero’s level, and your regulars will usually cap out well before your hero gains their next level. Presumably the idea is to keep the players using an assortment of creatures. The story is advanced by completing special story missions. These appear after you fulfill a certain set of requirements, like fighting a specific number of battles or summoning a particular amount of Fingermons. You can then tackle the story mission and should you win, you’ll be given the next set of requirements. Things move quickly enough in the beginning, but the further in you go, the more time-consuming it gets to satisfy those requirements and the more difficult the story missions themselves become. Some requirements ask you to summon using the location mechanic, so if you can’t go wandering around in the real world, you won’t be able to move forward. Mirror Land eventually devolves into a game where you grind battles to satisfy the requirements to make the story mission pop, then grind more battles to get to a high enough level to be able to beat that mission. Rinse and repeat. Contributing to the problem is that the fundamentals of combat don’t change as the game unfolds. The same things that you do near the beginning are what you’ll be doing hours down the road. 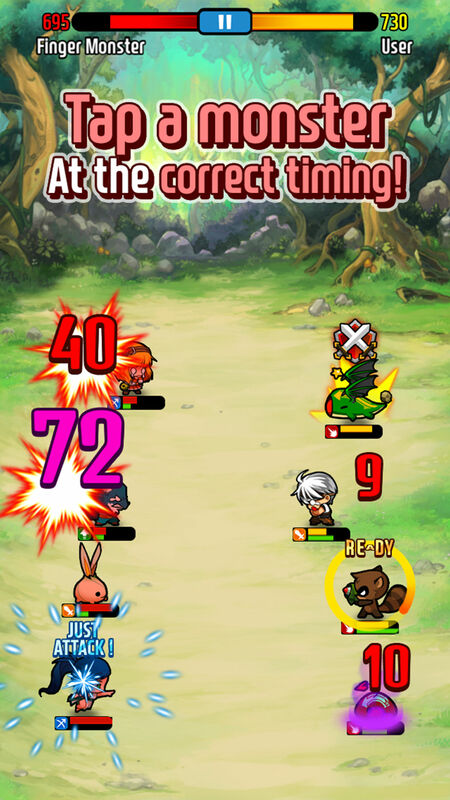 Watch carefully for each character’s turn to come up, try to tap them at the right moment, and hope your team is strong enough to outlast the other. It’s fine when you only need to do a few battles in a row, but when the game starts asking you to do twenty battles or try to level up to match enemies that are fifteen to twenty levels higher than you in order to proceed, it starts to feel like a genuine grind. A grind that demands your attention, mind you, so you can’t get away with doing it while you watch a movie or something. The characters also feel like they’re not balanced very well. Faster Fingermons are definitely more useful than the rest, as any attack will drain some of a character’s meter and slow their ability to take their own turns. That goes both ways, so using slower Fingermons becomes a formula for frustration as you watch your meter slowly climb only to get knocked down with each swift strike. I picked up a speedy silver character early on who could punch well above her weight level-wise, while a higher-ranked character who was strong but slow tended to get beaten up by far weaker foes. 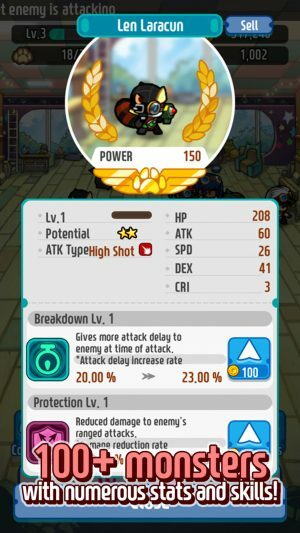 Besides leveling up through battling, you can also enhance your creatures by spending coins on their special abilities or cubes on ranking them up. Higher ranked characters tend to be a lot more powerful than their low-ranked cousins, though you’ll still want to keep an assortment of characters of each rank around for specific battles. Characters who are silver-ranked or higher have access to special abilities like drain strikes, attack buffs, and so on. They’ll use them automatically, but you can spend your coins to improve their effectiveness. Fingermons come in different types, with the usual system of each type having one type they’re strong against and one that they’re weak to. This doesn’t usually matter that much, but it can make a big difference in tough battles. It’s not hard to imagine a world parallel to our own where Mirror Land was a free-to-play game with a stamina meter and premium-currency summons. I applaud the developer for not taking that particular route, but I honestly feel like the game works a lot like one of those kinds of affairs. You can run as many battles in a row as you want to here, but I wouldn’t recommend doing too many at once lest the game start to feel tiresome. You can dump your coins into a ton of weaker summons, but you’re probably best to wait until you can afford a shot at the best ones. Progress is slow and tedious, battle strategies don’t change a whole lot over time, and the story feels like a bunch of weak connecting tissue to provide some kind of context for rolling the same situations over and over again. I liked this game in the moment, but the longer I played it, the less I wanted to. Mirror Land is better than I was expecting given this developer’s track record, and it can be quite enjoyable at times. But for a game that doesn’t try to extract any additional money from the player beyond the initial asking price, it sure feels structured like a game that does. The stop-and-start pacing and tremendous amounts of repetitive grinding required detract greatly from a game that could otherwise be pretty solid. There’s a decent game here, and it’s really only in the incidentals that it doesn’t shake out to be more than that.